I've really been inspired by some of the gorgeous projects that Liz has posted for the 2nd birthday celebrations at ScrapBoutique. I saw this project on Jewls' blog and just had to have a go. I loved how easy it was to make, and only took about 30mins. I didn't decorate it much, as the papers were doing that nicely. Don't you just adore these gorgeous papers!! They are definitely my fav's of the moment! Then I just wanted to keep scrapping... but the kids woke up! 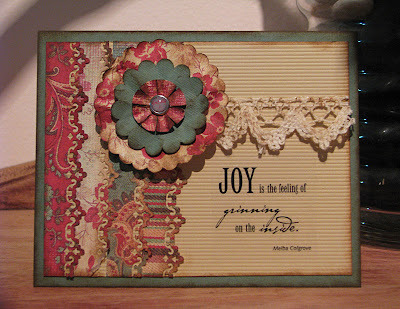 So, I set them to work cutting and pasting some of the goodies in their "useful box", which I created this card (another one of Liz's projects). I just adored this flower and will definitely be using this technique again soon! PS notice the super old papers I'm using up here. Oh WOW, Leah, that card is divine.Such rich colours? And no what PAPER is that ??? Love these Leah! especially the top one. Its been so long since I have bought or even looked at Paper I have no idea what either of these ranges are LOL! Just lovely in any case. The top ones are the new Bella - Sarah Jane ones that I got from Justine, and the bottom ones, I'm not sure, but they were in my scrap bin from about a year ago!